Prior to the 1800s, American and European farmers used plows made of wood. In Champlain as well as throughout New York State, the most popular plow used was the Dutch plow (also called a hog plow) which was a wooden plow built on a small cart with two wheels and dragged by horse or oxen. Wooden plows were good in sandy soils but would easily break when plowing rocky soil. The first cast-iron plow was invented in England in 1789 and improved in the United States by several people who were issued patents in 1797 and 1807. In 1819, a novel plow design was invented and patented by a New York man who used interchangeable parts made of cast-iron. This design became very popular as it meant a plow could be repaired easily and cheaply. In 1837, John Deere invented the first steel plow which was stronger than cast-iron and did not dull as easily. The steel was placed at strategic points on the plow. The establishment of the iron industry in Champlain coincides with the invention and introduction of the cast-iron plow in town. The first cast-iron plow was introduced in Champlain in 1820 by James Irvin who employed it on his farm. This novel plow design caught the attention of many of Champlain’s farmers who had arrived from southern New York, Vermont, Massachusetts and Connecticut between the 1790s and 1810s. After seeing this plow, several enterprising individuals tried to make similar plows. Ezra Blasdell cast Champlain’s first cast-iron plow near Perrys Mills in 1820. That same year, Noadiah Moore (1788-1859), the oldest son of Judge Pliny Moore, established the “Champlain Agricultural Works” in the Village of Champlain. The foundry initially made plows, but as the farming industry became more mechanized, new types of farming implements were manufactured. The foundry was adjacent to today’s Main and Cane Streets and situated on the Great Chazy River. It had an office and sales room opposite the Presbyterian Church (old village hall) near the corner of Main and Church Streets. In 1824, Moore purchased Blasdell’s small foundry. In 1819, at the dawn of the iron industry in Champlain, the Clinton County Agricultural Society was formed to showcase the county’s farms, farming tools and produce. On October 9, 1821, the annual meeting was held in Champlain with Noadiah Moore as secretary of the society. The agricultural fair was a perfect venue to showcase the Agricultural Works’ new plows and farming equipment which Moore had been making for only a year. Thomas J. Whiteside was one of Champlain’s first industrialists. He came to town in 1807 from Cambridge, New York, and operated a small store on Main Street in the village of Champlain called “Price and Whiteside.” When demand for timber by the steam and canal boat industry exploded in the 1830s (see the 2014 Champlain Historic Calendar), he built several sawmills near Perrys Mills and became Champlain’s largest exporter of timber. In the 1850s the sawmills were converted to paper mills which were in operation into the early 1900s and run by his sons. Operating a sawmill required a lot of iron and this may have prompted Whiteside in 1840 to build a small foundry on the south half of lot number one near the corner of Cedar and Main Streets (see map) in the Village of Champlain. In 1847, Whiteside decided to lease his small foundry to David Finley (1812-1881) and James S. Smith. The first of several contracts with Finley was signed on September 1, 1847. The establishment of this foundry by Whiteside in 1840 and the signing of the 1847 contract were the seeds of Champlain’s 148 year old business that eventually became the Sheridan Iron Works. Finley incorporated a very large steam engine at the foundry in 1847, the second ever brought into town. The corporation of “Finley, Smith & Co.” was short-lived. On April 25, 1856, James Smith decided to leave the partnership. He transferred his one-quarter share in the company to David Finley as well as other property, and in exchange, Finley gave Smith a large amount of personal property and lands and assumed all debts Smith would be responsible for from his interest in the foundry. The partners signed a new contract and stated the new company would be called “D. Finley & Co.” A dividend of 3 percent was to be distributed to the shareholders when profits were deemed sufficient and an extra $250 was to be paid to Finley each year. The contract also stated that if a dispute arose from this proposition, John Henry Whiteside would be the arbitrator and that the two former partners would abide by his decision. John was the son of Thomas J. Whiteside and a respected citizen and businessman in Champlain. James Smith later went into partnership with Samuel Mattocks Moore’s Champlain Agricultural Works. A new foundry company was formed on September 17, 1872, shortly after David Finley sold his half of the business. On this date, Timothy Hoyle, George V. Hoyle, George Hoyle Burroughs and newcomer Henry W. Clark signed a contract for the management of the foundry. The foundry’s partnership terms were similar to the one signed by Finley in previous years. The partners agreed that the foundry would continue in the direction that Finley was taking it and that they would make the same type of products. Clark would own one-half of the partnership and receive $1,000 for his service each year. The term of the contract would be for five years and expire in 1877. It also stated the new company would be called “H. W. Clark & Co.” Two months after the contract was signed, shareholder George Hoyle died. His brother Timothy was executor of his estate and likely assumed his share of the company. George had no living children. The expansion of the Champlain foundry’s business into the New York City market caught the attention of two brothers named Theodore and Charles Sheridan. James Averill was looking for more outlets for his book binding equipment, and coincidentally, the Sheridan brothers were looking for a location to expand their book binding manufacturing business. This mutual interest prompted Averill and Kellogg to sell a half-interest in the foundry to the Sheridans in September of 1887. A September 16 article in the Plattsburgh Sentinel noted the incorporation of Sheridan in Champlain: “A New Enterprise at Champlain. 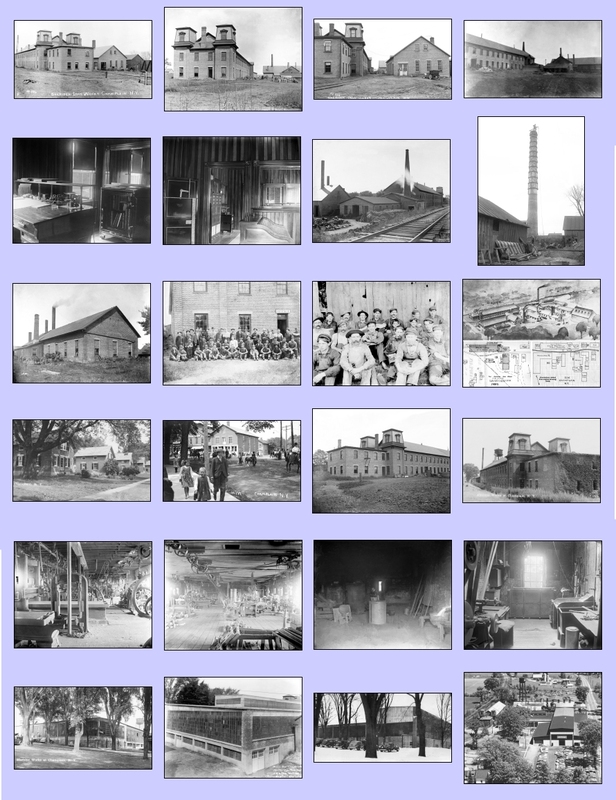 / The Sheridan Iron Works, to manufacture and sell machinery made of iron and wood, and to carry on a foundry business and machine shop at Champlain, Clinton county, filed articles of incorporation in the office of the Secretary of State on Saturday. The capital is $30,000, and the trustees: Theodore W. Sheridan, Brooklyn; Charles R. Sheridan, West Orange; James Averill, Jr., Champlain, and S. Alonzo Kellogg, Plattsburgh.” The New York City company was known as the “T.W. and C.B. 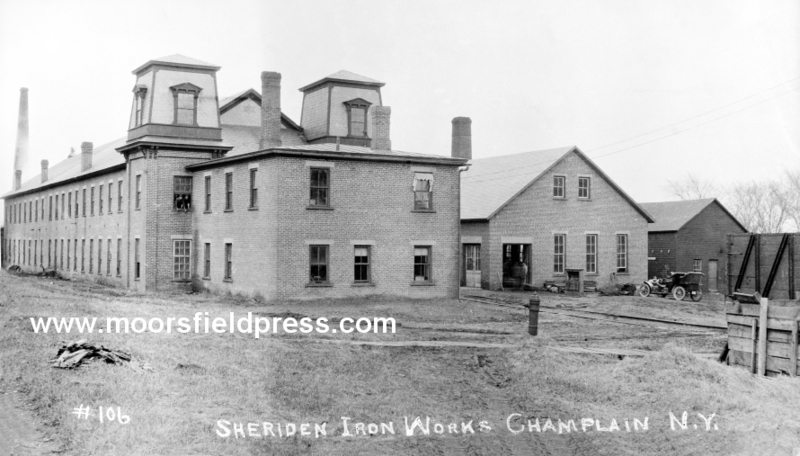 Sheridan Co.” The Sheridans built new buildings and increased the foundry’s size by 10 times before 1910. 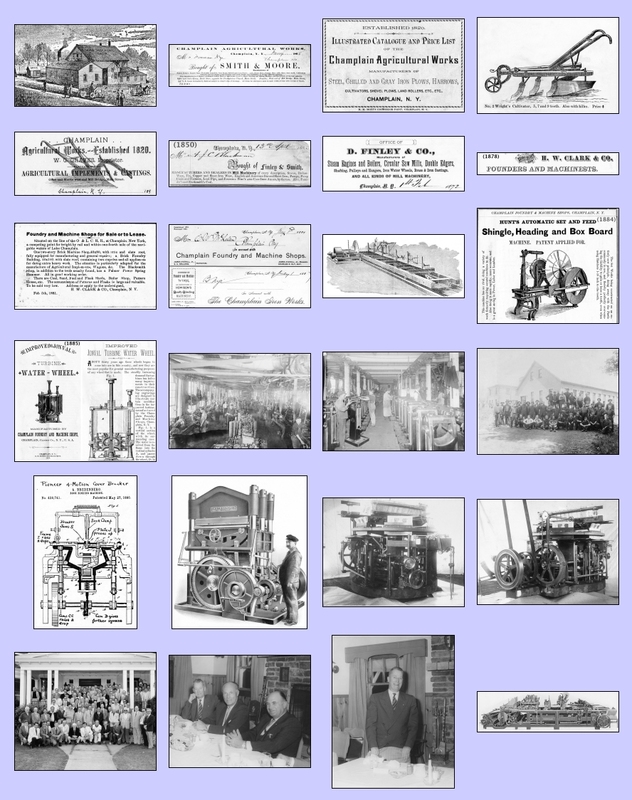 The number of manufactured water wheels, circular saws and steam engines dwindled as the company focused its resources on the manufacture of book binding equipment of all types. In the early 1890s, a young Swede named Alfred Bredenberg (1860-1935), of Brooklyn, New York City, started working for a book binding company founded by bookbinder and printer Charles W. Lovell (1855-1931). Surprisingly, Lovell was from Rouses Point and had been part of his father’s huge printing and book binding business. His father was John Lovell who had come to Rouses Point from Montreal around 1872 to start a printing press called the Lakeside Press, owned by “John Lovell and Sons.” John had three sons working for him: John W., Charles W. and Robert K. John already had a large printing and publishing house in Montreal called “Lovell Printing and Publishing Co.” The newly established press in Rouses Point did book printing and binding as well as other types of printing work and was the largest printing firm north of Albany. John’s son Charles was in charge of 100 typesetters in a room of the press. In 1876 Charles married a Rouses Point lady named Standish and moved to New York City where he continued in the book binding business. Charles and his brother John W. spent their later years in New York City where they are buried. John W. (1851-1932) had a son named Fred K. Lovell who moved from New York City to Rouses Point in 1923 and worked for a brokerage business. He was also prominent in local politics and civic activities. His daughter was Rouses Point resident Jean Lovell Marleau who died in 2013. In 1896, Alfred convinced his cousin, Isaac Bredenberg (1867-1907), also of New York City, to come to Sheridan and work for him. Isaac moved to Champlain and became their top erector of machines. Isaac had a technical education and graduated from the Royal Technical High School in Stockholm and was considered a master mechanic. Unfortunately, he had contracted tuberculosis before his arrival in Champlain and the long hours and travel for customers took a toll on him. He died in 1907 leaving his wife and four children: Oscar (1893-1970, born in NYC), Henrik (1895, born in NYC), Mabel (1897, born in Champlain) and Hulda (1899-1984, born in Champlain). Isaac’s son Oscar would be the third Bredenberg to shape Sheridan’s mission during a 49 year career there. During World War II, Sheridan’s mission changed. Instead of only making bookbinding equipment, the company was retooled to make presses, stretching machines and sheet metal benders for use in the aircraft industry. In 1942, a very large manufacturing building, 150 feet by 250 feet, was added to the west side of the plant (where Modern Mechanical is now) and the Clark house was moved across Elm Street to where it is today. The first stretch press was shipped that same year to the Edo Aircraft Company. This company built pontoon planes and floats for planes to land on in the Pacific Theater which was badly needed by the troops. The plant also manufactured presses used to build the Sherman tank which was the most popular tank used during the war. The tank was introduced in 1942 and was made by the Detroit Tank Arsenal and the Fisher Tank Arsenal in Detroit, MI, as well as by a half-dozen other companies over the course of the war. The U.S. Navy also shipped back manufacturing equipment for refurbishing at Sheridan. In 1964, Harris-Intertype Corporation of Cleveland, Ohio, purchased Sheridan. The plant was now part of the Bindery Systems Division and became known as Harris Graphics or Harris Bindery. The plant was still unofficially called Sheridan as newspaper stories from the 1970’s indicate. Harris was a worldwide leader in bookbinding equipment and now the Champlain plant had access to Harris’ engineering expertise and worldwide network of sales sites and customers. In 1979, the Press-Republican newspaper featured a very informative section devoted to articles about Champlain’s Harris division. At the time, the Champlain plant made 60% of the division’s binder systems. Each month's photograph has a detailed history written about the images below. Many other images and maps are found in the essay. The Sheridan Iron Works, circa 1909-1910. This photo was taken by Champlain photographer B.F. Paine who owned Paine’s Studios on downtown Main Street in the Village of Champlain. . This is one of the older photos of the foundry and shows the original two-story machine shop. It was probably taken around 1896 along with several other photographs in this calendar. This photograph was taken at the same time as the cover photograph. Paine’s car is seen parked in front of the second machine shop which was likely built between 1904 and 1911 (based on several other photographs that are dated). The east and north sides of the original machine shop is shown. The original brick foundry building is shown, probably in 1896. The small wooden addition with the brick chimney was the brass foundry. This photograph was taken in 1890 and is the oldest photograph of the Sheridan workers known to date. It was taken only three years after T.W. and C.B. Sheridan bought the foundry. The name key shows the following employees: George Palmer, Fred Dodds, Th. Lamotte, Pete Hamel, John Coonan, Fr. Dufresne, John Peat, Tom Kearney, O’Harra, Ed O’Harra, Alec Dufresne, Mag Kearney, Mr. Klang, Joe Gamlin, Pat Lafountain, Alex Chagnon, Mr. Minor, Paul Leware, Albert Hineth, Paul Babbeau, V. Lafountain, Mr. Miller, J. Greggory, Jim Powers, M. Cardin, Frank Patnode, Alex Patnode, William Patrie, Charles Roberts, Fred Senecal, A. Glode, Pierre LaRivier, Louis Sanschagrin, George Lambert, Rob Harmon, Pat Nolan, Mr. McKay, Francis Henry, Mr. Bancroft, Jim Kearney, Fr. Patnode and Ernest Lambert. The Samuel de Champlain History Center has the names key for the photograph that can indentify each person. This drawing was made by architect Hugh McLellan who lived in the village of Champlain. The Village of Champlain has always celebrated July 4th with parades. This photograph was taken between 1909 and 1911 near the corner of Main and Elm Streets. The two Nye brick buildings are shown in the background. The right building was removed a few years ago but the left one still stands. The machine shop and brick office building are shown before the building of the second machine shop shown on the cover photograph. The first floor of the machine shop shows numerous tools on the cement shop floor. The second floor of the machine shop shows additional machines and another long crankshaft that powered the tools. The second floor had a wooden floor. This photograph was taken in June of 1893 prior to the building of the brick office and shows all of the Sheridan workers. Fortunately, the names of these men are preserved on the back of the photograph. They include (in order of their numbering): Eddy Roberts, Fred Dodds, Ernest Bancroft, Mr. McClure, Jim Kearney, Tom Murnane, Tom Kearney, Mr. O’Harra, George Palmer, Pat Nolan, Mr. Dodds, L. Glode, Louis Sanschagrin, William Senecal, John Coonan, Glode, Mr. Barron, Pierre LaRivier, Thomas Lamothe, Fred Patnode, John Peat, Fred Senecal, Pat Coloumbe, Mr. Fish, Thomas Senecal, Mr. McKay, Mr. Gregory, Mr. O’Harra, Fr. Henry, Adelard LaFlamme, George Glode, George Lambert, Charles Roberts, Pat Lafountain, Oliver Lafountain, Mr. Eaton, Alex Dufresne, Mr. Martin and William Jefferson. The Samuel de Champlain History Center has a names key for the photograph that can indentify each person. The Sheridan plant is shown in the late 1950s or early 1960s. The original 1854 machine shop and brick office building is present to the left and is dwarfed by the larger buildings built in the last 100 years. All images in the 2015 calendar are courtesy the Special Collections, Feinberg Library at Plattsburgh State University College, the Clinton County Historical Association in Plattsburgh, the Samuel de History Center in Champlain or the author.